Tiny Lights is a new RPG style iPhone and iPod touch game from the UK developer Darling Dash. The app is a fun escape from the sword-slashing role playing games that are presently popular. The light people are unique characters, and that gives the story an incomparable twist. 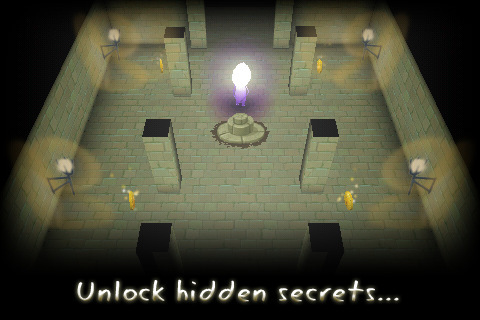 The game stars a few different characters as lights named Social, Link, Mystic, Brave and Alpha. 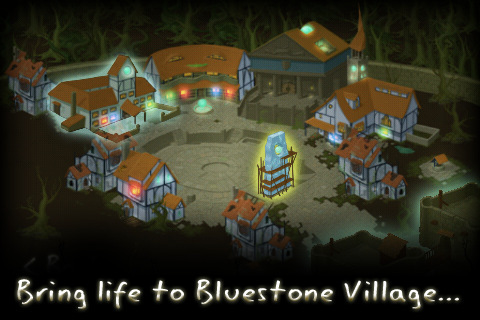 The goal is to collect Tiny Lights in a dark forest, free the Pillar of Power and bring the world of Bluestone back to order. The game has a set of core values built around friendship, bravery, wisdom, connection and leadership. The best way to summarize the game is to lay out what I really enjoyed, what could be improved, and what honestly the developers need to revamp completely. One thing that might be interesting to explore is how much people enjoy playing as lights. I found that I for one genuinely enjoyed watching the bright characters move and interact in the dark landscape of this iOS game. While Tiny Lights has many great features, there are a few areas that could be improved upon as well. The graphics could be improved, as well as the sensitivity levels during gameplay. The “TAP then hold” response time is a little delayed, and the player has to hold for quite some time. The controls in Tiny Lights are sometimes really difficult to handle, especially near objects in the scene (e.g., trees, rivers, “light eaters”). I never could figure out how to actually pick up the scrolls because there was not a light bulb that lit up next to them. The placement of the controls could be fine-tuned. Rather than having to tap all around the screen, maybe place the controls in the bottom left above the character tabs. Along with the controls, there is also the issue of limited screenplay. The graphics in Tiny Lights are enticing, but opening up the space of each frame will help. This will also give the developer a chance to spice up the graphics by adding even more details. As for the game’s overall flow, the “lights” walk maybe 15 feet and the player has to wait for the next scene to load. This makes the game feel as though it is dragging on at times. Adding a bit more fluidity to the gameplay would improve its score. Furthermore, the music is very appropriate for the somewhat creepy, erie setting, but grows to feel repetitive eventually. All that being said, I really think that The You Company (& Darling Dash, Fluid Pixel, and Codeworks Dev) have pulled together a nice game, for an excellent price point. Great app, great price. As it stands, Tiny Lights is an original RPG game that has a ton of potential, and worth checking out. Hopefully the developers continue to release updates and improvements to the game. There is talk of them also creating an online version of the game which should be interesting. AppSafari review of Tiny Lights was written by Darius Reimm on June 23rd, 2011 and categorized under App Store, Games, RPG. Page viewed 3433 times, 2 so far today. Need help on using these apps? Please read the Help Page.